SANITY FAIR: MARC JACOBS GIVE-AWAY! My life is full of tough decisions (is this the best moisturizing, loveliest smelling face cream on the entire planet? Is this steak cooked at optimal temperatures for both safety and taste? Will my tailor take out a hit on me if I have this pant cuff re-hemed one more time?). I've been told I'm picky, but I prefer to say "particular." As in, "this particular book won't do - can you get me a copy without a tiny, microscopic scratch on the back dust jacket?" These beautiful bangles could grace your wrist! So I'm very excited to be offering this gorgeous bracelet for you to win. Isn't it charming? I mean literally. It has charms. 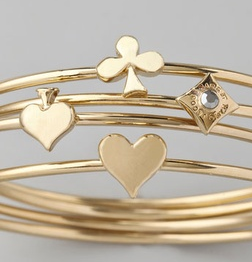 It's the Marc by Marc Jacobs House of Cards bracelet stack. Give-away host Designer Apparel is an exciting online search engine that carries hundreds of luxury brands. You can find wonderful labels from Ralph Lauren and Cole Haan, to Loro Piana and Tory Burch! It's a lovely way to do all your shopping on one website. 1. The give-away will end on Tuesday, October 26, and will be decided via random selection courtesy of Random.org. 2. To enter the give-away, you must become a follower of Sanity Fair via Google Follower or via Facebook (links to both, RH sidebar. Twitter will not count for this contest). 3. You must leave me a comment with email or personal website link stating that you've become a follower on any blog post through next Tuesday. 4. If you're already a follower via one or both of those options, just leave me a comment with email or personal website link and let me know that you're already a fan for automatic entry. 6. With apologies to all my fabulous Aussie and Canadian friends, this contest is for U.S. residents ONLY. (But if you can score a friend in the continental 50 who is willing to let you use their shipping address, be my guest!). If winner is unreachable after seven days, s/he forfeits the prize to second place. Good luck friends!!! I can't wait to see who wins! Pretty shiny things distract me...so beautiful!! SO pretty! Put my name in the hat! I am a follower on Facebook and Google, so make that put my name in the hat twice! Loved your introduction to this gleaming possibility it might be my wrist. Yes, I'm a follower and thank you for the compliment on "ho ho ho" spoon. It makes me laugh too. This is so funny. I was just going to enter this giveaway before you left the post and I got distracted! I follow your blog via Google Reader. Trying to remember if I follow via Facebook. If I don't, I need to! I adore the bracelets, so yes, would love to win!! Enter me baby! and my facebook like page is so pathetic. Go join it. I follow you everywhere (no, it's not stalking). What a fabulous give-away! I've never seen these before - love them. Now on to Designer Apparel to check them out. Oh and btw - love the post - I go through life with the same tough decisions! What a stunning prize. Enjoy the comp and good luck everyone. Im a follower via FB, RSS, and Blogger! I am just starting a blog myself and I hope it can be as splendid as yours some day. Love! I am a follower! Thanks for giving me the heads up on these gorgeous bangles. 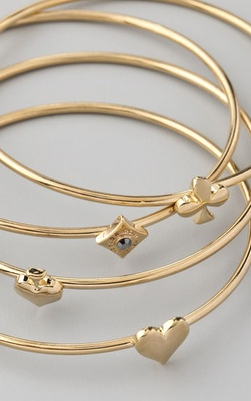 Every time you write about bangles, I want them all! Please enter me in the contest. I am a long-time follower and I added Facebook as well. I am not a US resident but have a friend or two who can help me out! I follow, and fingers crossed that I win this charming bracelet(s)! Have a lovely week my dear and don't worry, a good tailor is always happy to oblige our every whim right? LOL. i'm a faithful sf follower through google friend connect! i just liked you on facebook! i really hope i win! Love the bracelet piece. Lovely, ok, I will gamble with this giveaway! Hopefully my no. will come in! I love it!! I am follower through google. I come to your nice blog via of A View on Design Blog. I am now a follower on GFC as Chris. If I win I plan to gift this beautiful MJ bracelet to my dear daughter for Christmas. LOVE Marc Jacobs and I love his line of card-inspired jewelry. What fun! I love it and what a great giveaway. I think I already am a follower of you but will check out FB too. marc is my favorite!! good luck everyone! i'd wear the hell out of it. I follow you on Google Friend Connect and subscribe via RSS. Love these bangles! I would *love* to own something by Marc Jacobs! 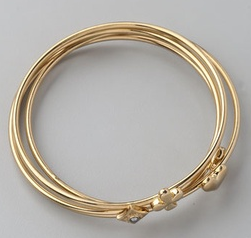 Wow I love these bangles just perfect, very classic. Count me twice as I follow on Google and FB!! Wow, this is a serious giveaway. Thank you for hosting it. I love it. Oh I'm a follower. good luck to me. lol Jenny - I'll have to "ask" Marc if he can come and present the award that way. He'd sure match the bracelets! And thanks everyone else who is participating! I'm so excited to see who wins!!!!! I am a follower and I must tell you I am feeling lucky! I am keeping my wrists fancy free for those babies. one of those aussies you speak of - but I can certainly rustle up a US address in the event of a win like this! Thx for coming by and leaving a comment on my blog and inviting me to enter this giveaway, and what a giveaway! I love this bracelet!! I am your newest follower now! Please put me in the running as I am a follower via Google and will go do facebook pronto. And thank you so much for leaving me a comment on my 1 year bloggversary!! Would LOVE some Marc Jacobs on my wrist! I'm a google follower! Love them! Great giveaway, thanks! Me! Pick me! How was I not already a follower?! I thought I was! I used to be - my darn google reader unsubscribed me - drat it! I looove your new header - it's darling. I'm also a facebook follower - so two entries for me! Do I need to leave two comments? Okay commenting again for my second entry. I follow here and on FB! PICK ME DAMMIT! well i am definitely a long time follower and i would love to win these beauties! very charming bracelets. Love these! Thanks for the give away. I'm a new follower. Wow, I'm needing some bangles so this is perfect. Been a follower for-evs. Count me in. I follow you in google reader as neelra22! What an awesome giveaway! I'm now a follower, but can't believe I wasn't already!! i am not sure if i am already following you on facebook. i am not so sharp when it comes to facebook. but i follow you on your blog for sure! Of course I follow SF! Just found you through a comment on another blog and am so glad I did. :) I followed you here and on Facebook! Count me in, please ma'am! Wow--I love these-the perfect gift for my SIL! I follow on FB. I also follow on Google! I am visiting for the first time. Your blog is so smart and beautiful.I will follow you with great anticipation. I've been following via Google Connect for a while and you can reach me at www.rococoandcaffeine.blosgpost.com. I couldn't resist a Marc Jacobs give away! Beautiful! I am a follower. I'm a follower of the Google Friend Connect persuasion. 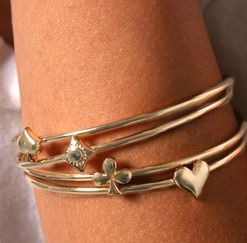 Love these bangles! You are my newest Facebook friend! I just broke my left wrist and have 4 more weeks in this cast. Would love to put on the bracelet to celebrate the cast removal!